The interior is exposed wood and low ceilings. One side is set up for dining while the other is more pub-like. Table service is available on both sides, though you can of course also buy beer at the bar. bob visited on a Saturday lunchtime in September 2013. There were plenty of tables available. There were several other customers also eating while I was there. 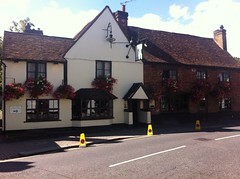 Ales available were Castle Rock Harvest Pale (£3.80/pint), London Pride (£3.90/pint), and Spitfire. The Harvest Pale and Pride were both very drinkable. I had the the pie of the day, which was pork and carrot (£11) photo. It came with a salad and some green beans. The pie was, disappointingly, really a stew with a puff pastry lid — but was tasty nonetheless. The green beans were very well cooked. The salad was fresh, and dressed with a very nice honey and wholegrain dressing. I also had a side of fries (£3) photo, which were very good. Accessibility: No step to get in. Level to the toilets. There is however a step up to the urinals in the gents. Last visited by bob, September 2013. Opening hours taken from the 2014 Good Beer Guide. Last edited 2015-09-12 13:59:40 (version 3; diff). List all versions. Page last edited 2015-09-12 13:59:40 (version 3).